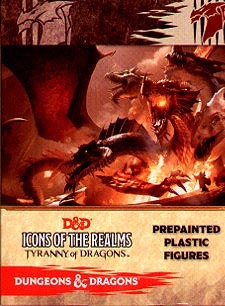 In Tyranny of Dragons, evil dragons and cultists form a dangerous and powerful alliance to force open a gateway for Tiamat -The Queen Of Dragons- to rise from the nine hells and wreak havoc across the forgotten realms. Will they succeed in their quest? Or will you help thwart the rise of the Dragon Queen and send Tiamat back to the nine hells? Contains 4 collectible pre-painted plastic figures. 44 figures in the set.